The cost of victory is blood, the cost of defeat is everything. 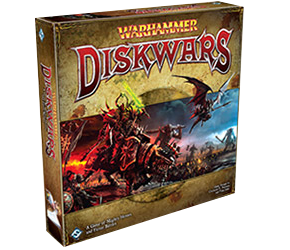 One of the early Fantasy Flight Games updated to fit Games Workshop’s Warhammer world, Warhammer: Diskwars is a strange beast; a miniatures game without miniatures. Instead your armies are made up of different-sized cardboard disks, which you move by flipping end over end and ‘pinning’ enemy disks to deal damage. There’s quite a lot to play with in the box (it’s only cardboard after all)—decently-sized forces for the Empire, Orcs, Chaos and Elves. Expansions sets are already on the way that will allow you to field Wood Elves, Lizardmen, Dwarfs, Dark Elves, Skaven and Vampire Counts.